‣ Select Windows > Toolbars > Storyboard. Converts a scene to 3D so you can move and rotate 2D objects in 3D space. Creates a new panel after the current panel. Select Storyboard > New > New Panel or press P.
Creates a new scene after the currently selected scene. Select Storyboard > Create Scene. Adds a new sequence to your project and displays the sequence markers in the Thumbnails and Timeline views. Select Storyboard New > New Sequence. Creates an exact copy of an existing panel. Select Storyboard > Duplicate Selected Panel. Deletes a selected panel. Note that it is impossible to have an empty project as there is a minimum of one panel. Select Storyboard > New Transition. 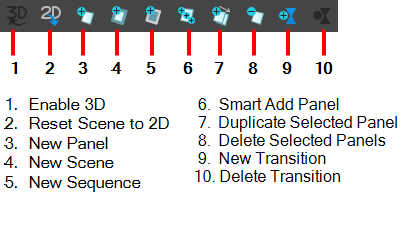 Select Storyboard > Delete Transition.